Sometimes ‘Love’ blossoms in the most unlikely places but even the most optimistic lovers wouldn’t bet upon UPSC to turn a matchmaker for IAS toppers. However, unlikely it may sound, the Union Public Service Commission (UPSC) – the apex recruitment body of the central government; turned out to be ‘Tinder’ for UPSC 2015 Topper Tina Dabi and 2nd Rank holder Athar Aamir Khan. 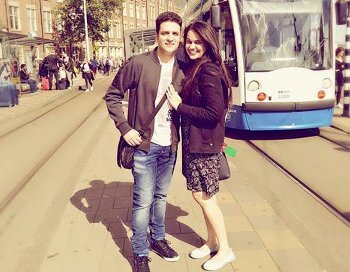 The Sarkari love story began with Tina Dabi stealing the 2015 UPSC topper’s position from Athar Aamir-ul-Shafi Khan in the last year’s IAS Exam. Apart from igniting the spark for their love, Tina also created history by becoming the first Dalit candidate to secure the IAS 1st Rank in UPSC Civil Services Exam. Just like Bollywood movies, Athar Aamir-ul-Shafi Khan who had secured 2nd Rank in UPSC IAS Exam 2015, fell head over heels for Tina, when they first met at the Department of Personnel and Training (DoPT) office in North Block for a felicitation function on 11 May. It was love at first sight for Athar, says Tina. “We met in the morning and by evening Aamir was at my door. Uske liye pehli nazar mein pyaar ho gaya (For him, it was love at first sight)”, she was quoted by Times of India. “But I thank Aamir every day for his perseverance. He is a wonderful person”, she quipped. Despite initial doubts, Athar’s wit and charm won Tina’s heart. Currently, Tina is undergoing rigorous training at Lal Bahadur Shastri National Academy for Administration (IAS officer training) in Mussoorie. Although, they are yet to finalize a wedding date, Tina is hopeful that their engagement will happen ‘’very soon’’. Taking the IAS love story ahead, Dabi and Khan have been quite open about their relationship, with both posting photos and social media websites. With success in both their personal and professional life, it might look as if the couple enjoys best of both world; but like every love story, even this one has a twist. The couple has mostly received support and appreciation for their relationship; there has been some criticism of their special bond; primarily over religious and caste lines. Tina Dabi is a Delhi girl born in a Dalit family whereas Athar Khan is Kashmiri Muslim from a small village. Many have hailed their love story as a testimony of country’s complex social structure is witnessing a sea of change. Brushing aside the negative comments, Tina says, “We are in love and very happy. But I must admit that I get very disturbed when I read stuff about us. We have stopped googling our names and reading news about ourselves. I think it is a small price to pay for being in the public eye”. The grace with which the UPSC topper couple has handled all the attention and interest only shows the bright future that lies ahead of them both in their personal lives as well as in while serving India in their official capacity. If you needed any more motivation or reasons to start preparing for UPSC Civil Services IAS Exam, you can count ‘meeting your life-partner’ as one, henceforth.